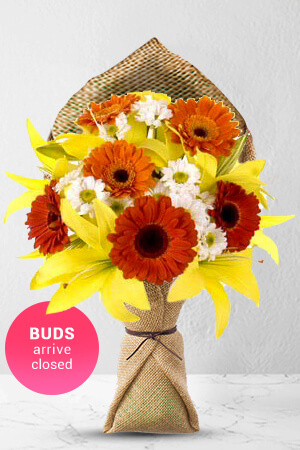 Sunny days help warm anyone's heart and this bouquet does just that! Vibrant coloured gerberas and lilies contrasted with white chrysanthemums will make even the gloomiest day shine bright! To ensure long life, the flowers may arrive with some closed buds which will soon open as fresh blooms and create a lasting impression.Lilies may be sent closed/partially closed in order to prevent damage and to last longer - Vase not includedThe vase in the picture is not included, but to personalise your gift, we recommend you include a standard vase to perfectly complement your gift. This time was fine, but I'm still annoyed by your failure to deliver my Valentine's day order until a few days after the event, followed by a complete lack of acknowledgement of my feedback about your applaiing service. It will take a long while before I am comfortable recommending your services to friends. Extremely fast delivery. Order placed at 9:30am, the flower was delivered wihtin an hour. Many thanks for a very good service. Everything worked perfectly and my wife had been very happy with the flowers! Arrived on time and quality was good thank you. delivered on-time and in excellent condition and as advertised.